At last spring is truly here – all around our village the hedgerows are bursting into leaf while the sound of birdsong in the mornings is almost deafening! This is one of my favourite times of year as we look forward to the warmer months ahead. This month’s issue has a definite feel of spring too as we take a look at the bird we most associate with the season – the Cuckoo – as well as some spring flowers too – the daffodil, bluebell and wild garlic, whilst Rosie’s Recipes celebrates the availability of lovely fresh laid eggs from small flocks up and down the country. Our little Spring Lamb is possibly my favourite pattern this month, and I’ve also included some tips on working with fleece fabric. And don’t abandon your unfinished projects, we have some hints to help you learn to love them once again. 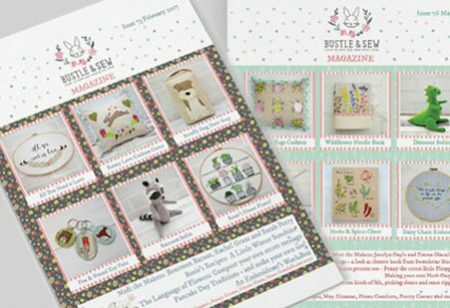 The Bustle & Sew Magazine is the work of just the two of us – Helen Dickson, the founder of and creative force behind the Bustle & Sew bunny and her daughter Rosie who’s a bit of a whiz in the kitchen! So if you’re expecting a glossy high-street, high-budget publication, stuffed with adverts and promotions, then this probably isn’t the magazine for you. But if you’re looking for quirky, unusual and fun sewing projects, all with Helen’s unique style, and enjoy filling your home with beautiful ideas, then you’re sure to love the Bustle & Sew Magazine. Don’t forget, you are free to sell items you personally have made from Bustle & Sew patterns. All the templates are included at full size, so there’s no awkward re-sizing – no fiddling around with photocopiers or hanging around at printing shops – you can start creating straight away! I don’t mind if you personally want to make items to sell from my patterns, but you are not licensed to go into mass production.